Shelby’s life was changed when she found out she was getting a full scholarship to the University of Kentucky College of Education, thanks to the generosity of two people she had never met. No one understands the value of a good education more than we do. It permeates everything we do. It starts with our core values. We teach students to inquire, innovate and inspire, creating leaders who can identify and tackle the world’s most pressing problems with creativity and zeal. 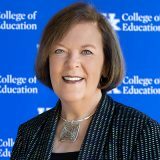 As a result, the University of Kentucky College of Education has nationally-successful education programs. Our faculty and staff win competitive national grants and are conducting cutting-edge research. But no success is earned alone. You motivate and encourage us, support and nurture our growth. Thank you for your ongoing generosity. The financial needs of the College are constantly changing as the needs of the academic departments and programs evolve and grow; we want to support as many students as possible through scholarship aid. It is through the generous support of our alumni and friends that we are able to do all of this. Please know that each and every gift to the College of Education is sincerely appreciated. Don’t hesitate to call if you have any questions about making a gift to the College. We would love to hear from you and share ways in which your gift would be best utilized.